David Cameron has paid tribute to the fallen soldiers of the First World War, including his great-great-uncle, Captain Francis Mount. Captain Mount - a relative on his mother's side of the family - was 43 years old when he volunteered to fight in the conflict. In 1915 Captain Mount was posted to Loos, northern France, where he fought as part of the Royal Berkshire Regiment. But it was there that he died - killed in action during the Battle of Loos on 12 October, 1915. He served with the Royal Berkshire Regiment in northern France during WW1. The Prime Minister said of his ancestor, "Almost half of the people that he served with didn't come home, and it does help to make a personal connection with this massive sacrifice that took place." 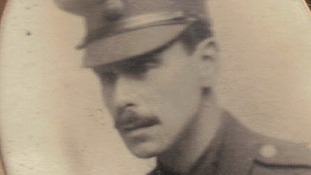 One of 'A' Company's early casualties was Captain Frank Mount who was initially posted as missing. – An excerpt from a book on the Battle of Loos. Captain Mount's body was never found, and he became one of the many thousands of First World War soldiers who have no known grave. As the Lights Out event to remember those who fought and died in WWI happened last night ITV asked our viewers what they did to take part. Lights on some of Britain's most famous landmarks were extinguished between 10pm and 11pm to remember those who died in WWI.